Covering an area of approximately 33 acres, Kuching Paragon is distinctly the most contemporary integrated development to impact Kuching. A new landmark which introduces multifaceted lifestyle experiences integrating residential, business, retail and hospitality components, the Kuching Paragon integrated development brings together the diversities of modern living and business under one common address, that fulfils the demands of the present and sets the trends for the future. Nestled amongst mature residential and commercial and industrial enclaves at Kuching South, the development site is easily accessible via major thoroughfares, Jalan Batu Lintang and Jalan Rock. Accessibility will be further enhanced with the proposed loop road running through the site. 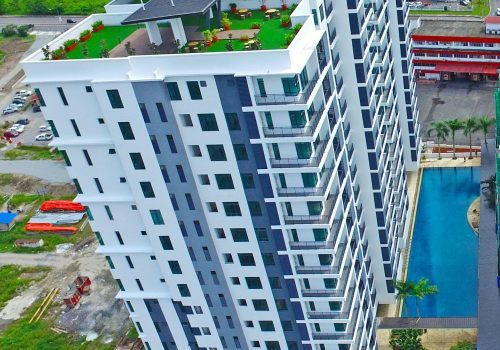 The development site is also a mere 10 minutes’ and 15 minutes’ drive from the heart of Kuching City and Kuching International Airport respectively, making it a prime location. 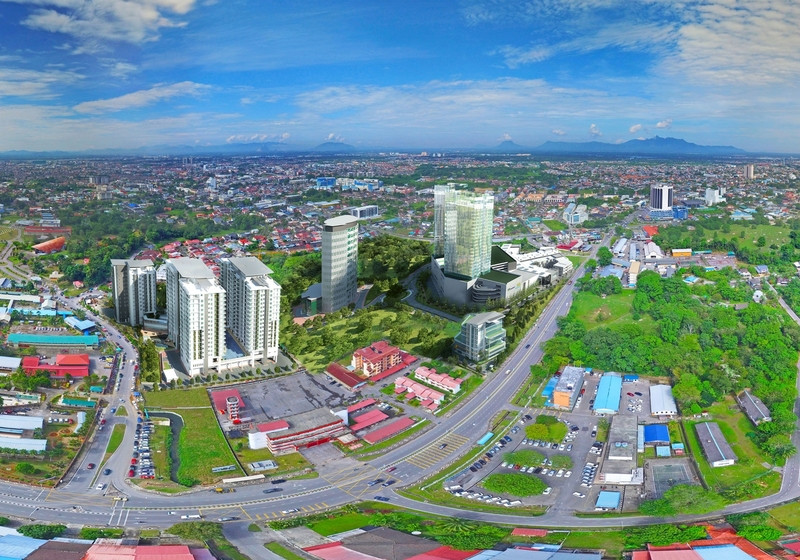 Upon completion, Kuching Paragon will provide close to 1 million sq. 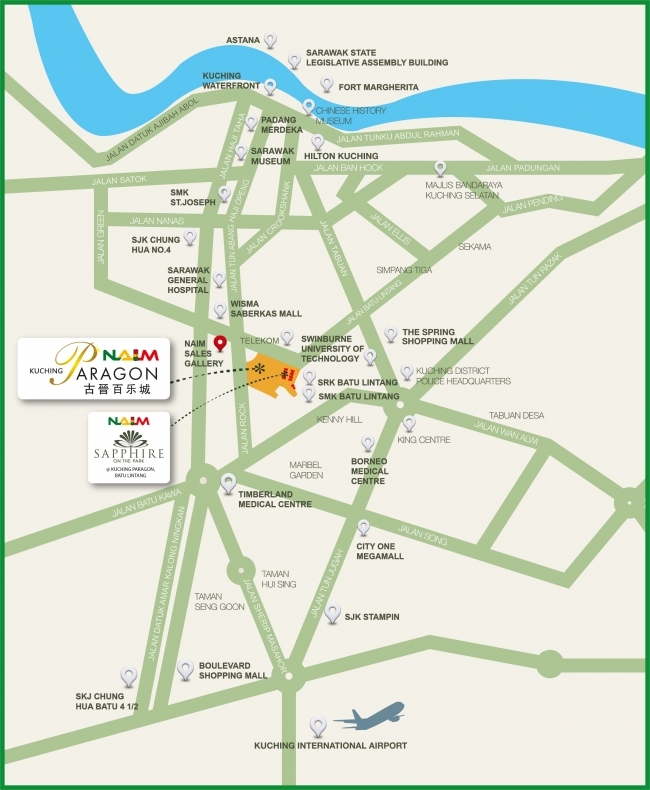 ft. of retail space, condominium tower and office towers, hotel and serviced apartments. It’s your world in one place. Live It Up, And Live It Up In Style Within the iconic Kuching Paragon, 3 residential towers rise majestically as one of the most sought after luxury apartments in the region. With a total of 427 residential units and built with a contemporary tropical minimalist concept which epitomises resort and chic urban living, the SAPPHIRE ON THE PARK condominium development is in a class of its own. Be it siesta or fiesta, it’s a life of envy. Live It Up, And Live It Up In Style. Only At Sapphire On The Park. 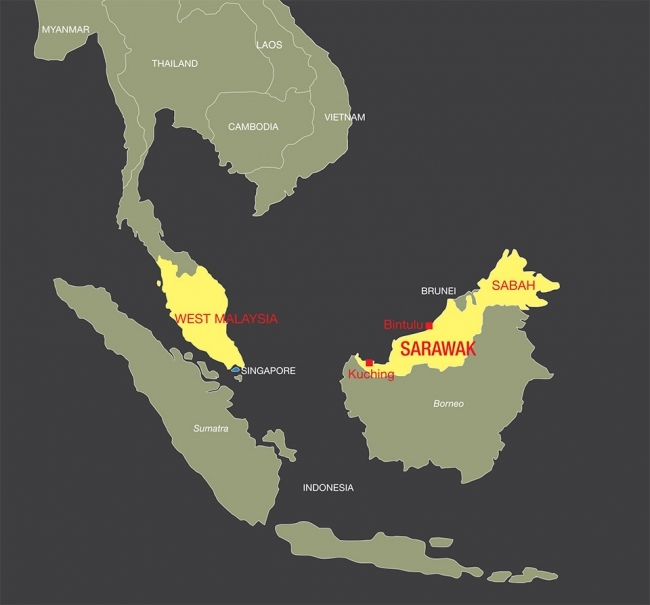 Strategically located in the heart of South East Asia, Sarawak is an ideal centre for many types of industries and is fast emerging as a hugely profitable investment hub. As the largest of Malaysia’s 13 states and covering an area of 124,449 sq. km, Sarawak has vast tracts of land available for development and an abundant supply of natural resources, particularly petroleum and natural gas.Sarawak’s economy has been transformed in recent years, as the State diversifies away from its traditional reliance on mining, agriculture and forestry. Today, the Government is developing the State’s infrastructure, high-tech industries and renewable energy sources with the aim of creating 1.5 million jobs and long-term economic prosperity by 2030. SCORE is a major initiative to develop the Central Region and transform Sarawak into a fully developed State by the year 2020, by accelerating economic growth, and improving the quality of peoples’ lives. 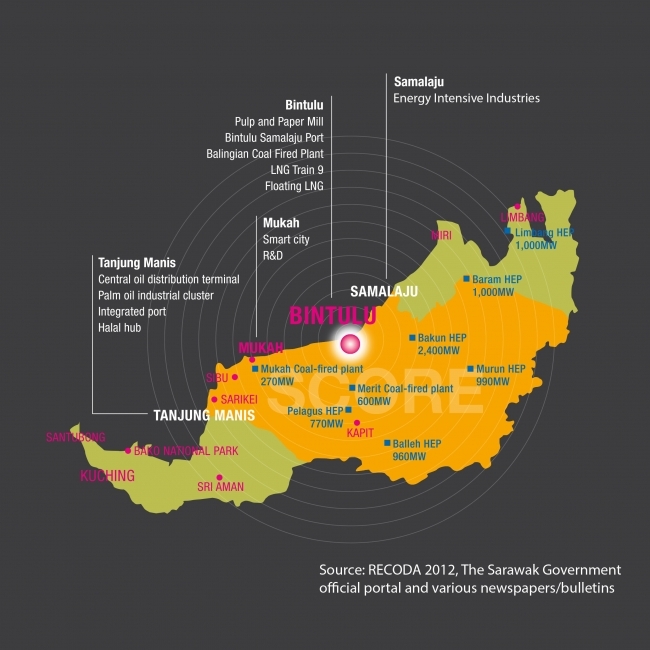 SCORE is expected to attract more than RM300 billion worth of planned investments into the State. The spill-over of investments will encourage growth and create more job opportunities, a factor in enhancing migration of workers into the State, especially its key growth areas. Kuching, as the capital of Sarawak will definitely benefit from these spin-offs. Additionally, Kuching, being Sarawak’s administrative centre, will generally see positive population growth leading to vibrant communities and business environment. Kuching was also reported as the ‘Most Interesting Retirement Spot You’ve Never Heard Of’ (U.S. News and World Report,14 Dec 2012), making it a desired retirement spot for those not from Sarawak. Naim Holdings Berhad shall ensure that the collection, use and disclosure of your personal data is consistent with the Malaysian Personal Data Protection Act 2010 ('PDPA') and the relevant Privacy Laws in place in each jurisdiction that Naim Holdings Berhad operates in. It is acknowledged that personal data collected and processed is obtained voluntarily and with your consent.